Conflict is an inevitability in life. In fact, conflict is a sign that we are truly alive. As long as we are beings with free thought that move, consume, and produce, there will be conflict. I have a gift, some would call it a naiveté, for conflict. According to my iChange type, I am "engaged" in change. I'm not one to suggest change for change's sake, but I'm a proponent of necessary change and less reluctant than most to dive in. Because I'm willing to let go of some things for the sake of change, I have a tendency to find myself in the midst of conflict. This week's sermon is on the conflict we find when we pursue God's vision. Understand this clearly: when we choose to live as God's people and chase his vision through our lives, whether as individuals or as the church, we are essentially welcoming conflict. It will happen. Conflict takes two forms - internal dissention and external threats. Internal conflict is the one that always gets me. Long ago, God spoke to Moses, gave him a vision to lead the Israelites out of Egypt and their slavery there. Pharoah relented and released them, but changed his mind later. The Egyptian army began to chase after the Israelite people in the desert - clearly an external threat. What was the response of the people though? In Exodus 14, the people turn to (on) Moses and begin asking questions like "Was it because there were no graves in Egypt that you have taken us away to die in the wilderness? What have you done to us? Didn't we tell you to leave us alone in Egypt?" Moses was probably wondering at this point if his own people would lynch him before the Egyptians had the chance. His response to the people? "Do not fear. Stand firm. Watch what God is going to do." Sure enough, God parted the waters, granted safe crossing for the Israelites, and drowned the Egyptians. "Moses provided a revolutionary alternative for the slaves, an alternative to the demands of Egypt. In prospect, such emancipation had been attractive. In hand, however, it is only a profound hardship. It is difficult to sustrain a revolution because one loses all the benefits of the old system, well before there are any tangible benefits from what is promised" (The New Interpreter's Bible Commentary). It's hard to give things up sometimes on a bet that better things will happen. It's like the kid that has to let go of his security blanket so he can grow up. A friend of mine, the one who helped me discover my call to ministry, has a powerful story. When he was in high school he accepted Christ. That week, he came home and shared his decision with his parents who were outraged. They were so upset that they kicked him out of the house! Years later, Tom became a missionary in the Northeastern United States. He lived a meek lifestyle, but powerfully touched the lives of hundreds of people - those living in some of our poorest communities and those with affluence who came to serve in those neighborhoods. In large part, because of Tom, I am in ministry and working to help God change other people's lives. Tom sacrificed alot and it would have been most people's reactions just to abandon faith and calling to keep a home and to live comfortably. Tom wasn't willing to concede though. Even when cancer tried to keep him home, he was following God. Today, he's still at it and living a far more blessed life than he probably would have otherwise. Conflict is inevitable. What matters is how you deal with it and how you survive it. We experienced a multitude of people coming through the doors at Mt. Bethel on Saturday. Maybe it wasn't 5,000 and rather than fish and loaves, it was fish and hushpuppies, but a multitude was fed. In April, one of our members, a 35 year old husband and father of two, was diagnosed with metastatic malignant melanoma. It starts out as skin cancer, and in his case, it spread into his endocrine system and quickly to some of his major organs. He's undergoing treatment that has a 5% chance of success, so the prospects seem pretty grim. Mt. Bethel has rallied around this family, not just because they are part of the church family, but because they are a family in need and we can do something to make a difference for them. Saturday, several of our men and women showed up at the church around lunchtime, heated up some peanut oil, and fried almost 200 lbs. of catfish. By the time I got home Saturday night, I was greasy and tired. Together, we raised $6,000 for Jason and his family. I enjoyed listening to the buzz around the church that afternoon, which carried over to Sunday morning. People who estimated they would raise $2,000 to $2,500 were clearly blown away by the difference that was made. 475 people came through the door on Saturday. Some drove from an hour or more away. Many live in the community and have no church home, but saw a flyer. Not bad for a 230 member church! I think more has happened than feeding a multitude and helping a family through hard times. I think some eyes were opened and God is laying the foundation for the vision and getting people where they need to be to help the church pursue that vision. Saturday was a teaching moment. Two years ago - almost one month after I arrived here - some of our leadership hosted a fish fry. The 2007 fish fry was to raise money for our building debt. Not because we weren't able to make payments, but because we wanted to pay as much as possible on the principle of the loan. When the dust settled, we raised about $1,800 for the building. Everybody being blown away by Saturday's turnout blessed me with numerous teaching moments. I've had frank conversations where I didn't have the opportunity before. Many people didn't see the difference in the fish fries until the tally was made and it became clear that there is a difference between fundraising for "selfish" purposes - money we spend on ourselves - and fundraising for "selfless" purposes - money we spend on others. God blessed the generosity of a few and multiplied their sacrifices to bless someone else. In so doing, the Kingdom of God became visible to dozens of people. Eyes were opened to what the mission of the church really is and the fact that God blesses our efforts when we pursue his ends. As you read this, say a prayer for Jason and his family. Today (July 28th) he is undergoing a PET scan to determine if his treatments are working or not. Hopefully tomorrow he'll get his results. I'm sure you've heard that quote before - it's the famous one made by Neil Armstrong as he stepped out of the lunar module onto the surface of the Moon. Monday was the 40th anniversary of that historic occasion. It was before my time, and I don't think I truly appreciated the sequence of events until recently. You see, almost seven years before, President John F. Kennedy delivered a speech at Rice University in which he casted a vision for that lunar landing. 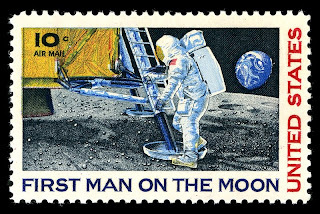 In his remarks, he said, "We choose to go to the Moon in this decade and do the other things, not because they are easy, but because they are hard" (emphasis mine). Did the President know something that the rest of us didn't? Was he making an outrageous claim and betting/hoping that it would come true? Even more importantly, without his dedication to the space program and his insistence that this was possible, would we have strived as hard for this accomplishment as we did? Would we have followed through or come up short? Would we have tried at all? I've been talking a lot about vision lately. JFK's vision is a great example of what it means to have vision and to cast that vision. The "what" of vision always preceeds the "how." Nobody knew how to make this happen at the time. In fact, the majority of attempts to crash-land a rocket into the moon prior to that were an utter failure. This is a pretty good analogy for what our vision should be in as the Church. God desires for us to literally "shoot the moon." His plans for us are far beyond our own competency and we have no way of answering when someone asks us how we'll do it. The point of vision is to allow it to mature in you and allow God to mature you for the vision. As we pray and prepare, doors open, God's plan unfolds. When it's done, everyone knows that it has to be God's work - because it wasn't ours and we weren't just "lucky." Nehemiah, long ago, rebuilt the walls of Jerusalem because he had a vision. When it was complete, this is what Nehemiah had to say, "When all our enemies heard about this, all the surrounding nations were afraid and lost their self-confidence beccause they realized that this work had been done with the help of our God" (Nehemiah 6:16). Do you have a vision? Chances are, if you can answer "how" you'll accomplish it, you don't have a vision, just a good idea or a goal. Goals are good and necessary in life - their a mark of our ambition. Vision, though, is a mark of God's ambition and our faithfulness. Find it. Chase it. My last post was about the campmeeting sermon that I'll deliver in three days. The theme for this year is "Coming Home" - a theme that I've struggled with for several weeks. If you're planning on being there this week, don't worry, I won't spoil my sermon here. Home is a tricky topic for me. I don't think of home like many other people think of home. I was born in 1980 and in 18 years (before college), my family lived in 6 different houses in 3 different states. In that time, I went to 5 different schools. When I went to college, my family moved again. You remember how your parents turned your bedroom into a guest room while you were away? Mine moved to Nebraska before my junior year. After college, I moved to Metro Atlanta for grad school. I served one church for 2 1/2 years and another for 2 years before moving to McDonough, where I am now. Since then, I have been a candidate for ministry in a conference that I did not have a membership in. Upon commissioning and ordination, I became an itenerant minister, which means that if I'm like the other United Methodist Pastors, I'll move an average of every 6 years for the rest of my career. I think I might qualify as a nomad or a rambler. In my 29 years, the longest I've lived in one house was 5 years. Can you see why this theme might be a challenge for someone like me? I have several friends that talk about home being the place that they graduated from high school, where their parents still live and they still have friends that they reconnect with. That concept is something completely foreign to me. Home has a different meaning for me. It's not the house or the town (maybe that's why I so easily see the church as something more than a building). Home isn't the place or the things that I've known my whole life. Home is where I find love and support. Home is where my wife is or my parents are. Home is where there is a church that accepts me as one of their own. Home, for me, is Valdosta, LaGrange, Dacula, Lawrenceville, McDonough, Oakland, Duluth, and Milledgeville. It's a 1960's brick house on GA-81. It's the new home of my parents. It's a small church ready to bust out and a large church bringing up the next generation of ministers. Its an in-between church where people still call my only by my first name (instead of Reverend Stroud). Its a college campus. In so many ways I think I'm blessed. Home is wherever I am with others that love me. I'm not tied to a place like so many others are. The big question, I guess, is what it means to me to "come home". Where is home for you? Have you thanked God that you have a home? Its summer. In the South, as a Methodist, that usually means one thing: Campmeeting. Campmeeting is a tradition that started about 200 years ago when there weren't enough pastors to have one stationed at every church, or even at every circuit (partnered churches). In the South, Campmeeting was the time that everyone would take a week off from their usual work and Christians, regardless of denomination, would gather at a traditional place, pitch tents (that look like rustic cabins) and stay for a week of fellowship and preaching. The tradition continues today, only people have stopped taking their livestock with them and now enjoy electricity and indoor plumbing. Last night, I went out to Shingleroof Campmeeting, here in McDonough. Mt. Bethel was once one of the partner churches in the campmeeting - it owned one of the tents until a couple of decades ago. I've learned over the years that campmeeting means different things to different people. For some, it's a chance to do something different for a week of the summer. For others, it's a chance to catch up with some friends from the past and walk together down memory lane. I'm amazed to see people advanced in years that remember days that their parents and grandparents brought them out to that sacred place and I watch them as they stand a little taller, smile a little more, and feel the life inside of them. Others, like myself, think at first of the heat, the dust, and the bugs. Once we get past that stage in our minds, we remember the preaching - hearing a voice that you aren't used to hearing (for better or worse). We remember the stories and traditions that older generations have faithfully shared with us and passed down to us. We envision a meeting place that so closely mirrors the earliest believers that we read about in Acts 2. I've learned that campmeeting is a break from the rut of life that has the ability to recapture the attention of so many Christ followers, giving us a renewed sense of calling and vision. One of these days I'll figure out how to preach without a safety net (notes). My notes now are at a minimum - basically a short outline to keep me on track and help me remember my transitions. Later this week, I'll get my first shot at campmeeting preaching. I'll return to Lawrenceville Campmeeting on Friday, where I was a worshipper for 6 summers and coordinator for 2 of those. I'm preaching a morning service, which isn't quite as big as preaching in the evenings, but I'm also preaching Friday, at the end of the week, which is prime real estate as far as preaching goes. I'm excited and I'm nervous. Many of the people I'll see I haven't seen in two years. Things have changed a lot for me in that time - I've grown a huge amount and my family has too. I think I've found my own preaching style again in that time as well, so my sermon won't sound like the ones I delivered 2+ years ago. I look forward to it though. In ministry, Lawrenceville is probably where I would consider home. Its where I cut my teeth in ministry, where I became a Rev., where I became a father. Its where I was allowed to make my biggest mistakes and take my biggest gambles. This year's campmeeting theme is "Coming Home" - one I'll talk about in my next post - how appropriate to have past ministers return to bring God's message to the people. Am I due for another rant yet? I feel one coming on. How do you deal with things? Do you confront issues head-on, or do you have a tendency to let things fester for the sake of a sense of "peace"? I have a frustration that has been brewing for a few years among my own colleagues. Too many ministers today can be said to be "non-confrontational." I've been watching as large churches and small churches refuse to move forward because the issues that are holding them back are not being confronted. I'm listening to stories of friends and family that are considering finding a new church because their pastor won't stand up for them or their needs. I'm witnessing staff members who limit ministry to their own abilities because their senior pastor won't push them to be more. God, I pray that I don't become that insensitive and impotent. Don't get me wrong, confrontation is hard. It will give you the same sensation of trying to ask out a girl at age 12. You get a pit in your stomach, break out in a cold sweat, your vision may blur, and you may feel like puking, and when it's all over you may not remember everything you said, but you know that it's something that needs to be done. Confrontation is about justice. Without justice, I believe that true peace is something you can't find. I watch as a church member gets trampled by others. Maybe they come to me, seeking my support. I show concern, but refuse to act - what happens? That church member loses confidence in me and possibly his or her church. The perpetrators are allowed to continue in harmful ways and we become something other than the church God wills us to be. Now, on the surface, it may look calm and peaceful, but underneath, people are harboring ill feelings, plotting revenge, and considering ways that they may exploit others to increase their own kingdoms. I just heard a story this week of a family member who is considering leaving her church for another because one of my colleagues refuses to take corrective measures with a staff member. Last week, it was another colleague telling me that he's relied on as an associate pastor to make all the confrontations for the senior pastor because the senior is unwilling. Years ago, it was watching certain church members manipulate an entire church staff because there was no accountability from the senior pastor. Before that, it was an entire staff leaving and a large number of members walking out the door because the senior pastor was an enabler to those with selfish ambition. These kinds of stories hurt. This is not the picture of what a church should be. While we are a place that embraces all people and nurtures them, an important piece of that is accountability. Yes, I know that not all battles are worth fighting and no, none of us should charge into a situation blindly and with unnecessary force. However, when there is injustice, oppression, or exploitation, our action should be swift and sure. If we as pastors (shepherds) are unable to protect the flock, then who will? Let's start the day off on a high note. I haven't posted in a few weeks because I've been busy - really busy. It's been a good kind of busy with many conversations and teaching moments. People are beginning to dream and seek vision for their lives and for their church. That's tremendous news! I'm reading several books right now: Andy Stanley, Ed Hammett, Kem Meyer, Mike Slaughter, and George Barna. Every one of them has confirmed that we are on the right track and good things are going to happen. I'm preaching on vision right now and I have to say that its been the topic that's gotten me the most excited and recieved the greatest response at Mt. Bethel to date. And it's a good opportunity to preach some fun Old Testament stories too. Here's what I know: God has a vision for every person and every church. That vision is never death. It is never the status quo either (sometimes you can't tell the two apart). God's vision is of a promised land that we've never seen, dry bones that come to life, and a Kingdom without limitations. Chasing that vision is hard work. Sacrifices will be made. But there is never a day of drugery when you have captured God's plan in your mind and you spend your energy working for its realization. Are you wandering through life or do you know what God has in store for you? Each of us has a part to play in the grand scheme of things - what's yours? Is it, whatever it is, going unnoticed, un-pursued, and undone?